this is to inform you of our latest and greatest. multimonitor support is greatly improved. still not perfect but on its way..
deinterlacing via videotexture finally seems to work smoothly with only 2 frames delay from the input. the new ColorTracker is not yet spreadable but still great and only part of what is still to come in that field..
with SetPatch (VVVV) we introduce another complete universe. be sure to check its helppatch. may this help you during the upcomming boring days. so patch yourself and gut keks. there's a very nice article about vvvv in the latest iX-magazine. in fact a very sweet introduction into vvvv with the approach to get around this sometimes loose toolbox and just a more practical way to describe it. The exhibition "Experience Art! - fascination art and technology" shows selected works in the fields new media art, cinetic art, cybernetic art, interactive sound and video installations are represented. My partner Giovanni Longo and I, Peggy Sylopp are art directors of the exhibition. Beside works of renowned joint founders of the media arts such as Sound Wall (Peter Vogel), Talking Machine (Martin Riches), Breathing Suitcases (Benoit Maubrey) and the Flamenco Magnetico - robots (Nicolas A.Baginsky), there is also the work of young talents, for example Camera Lucida (Dmitry Gelfand and Evelina Domnitch), Sonobotanic Plants (Marije Baalman) and Metaforms (Tim Coe). Also shown is my installation Crackling Water: the visitors watch a video installation and are filmed by a camera at the same time. Their motion causes bubbles to appear on the video in realtime. For the realization I implemented the motion detection of pd in combination with wave simualtion of vvvv. Main subject of our diploma thesis is to determine to which extent a dataflow graph is suitable for building complex web server applications in an intuitive way. It might sound a little diffuse, but for you, it’ll result into a straightforward bunch of new nodes. Finally there will be two new node categories: XML and HTTP Server. While the HTTP Server allows to serve (X)HTML strings to the WWW, the XML Nodes open a huge field of creating and respectively transforming those strings. The HTTP Server is split into two nodes: Server & Receiver. The receiver throws out HTTP Requests, now you can let server serve request-depending strings. You can already try the first set of new nodes with beta9.2. We’ve created a diploma page with the current state of our work. Later we will provide example modules as well as tutorials for the XML Stuff on that site. diploma page? once again just in time for you to get your christmas presents patched together. if you want trouble you know how to bug us. vvvv workshop of the labweek at the HFG schwäbisch gmünd. the goal in the 5day workshop is to build an installation with vvvv. 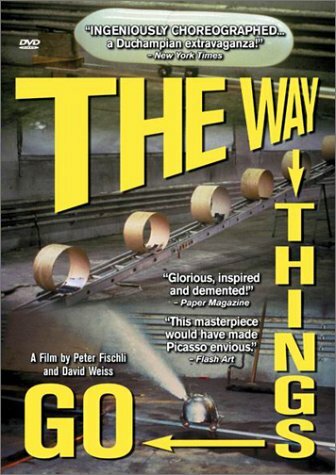 in an homage to The Way Things Go by peter fischli und david weiss we will build a selfrunning graphical to physical chain reaction. timescratch is waiting to distort your constant daily trot at the stopspot05 festival in linz. two days of fine muzak and apfelsaft. you better not miss this. Did you see the Users page? Check the Users? page. It is thought to be the place to all different user activities. Then the community page also links to all downloadable stuff from the users.